This is a Gallery Script that uses “Kwicks Gallery” plug-in. • event: ‘click’ – the gallery will open a new slide when you click it. 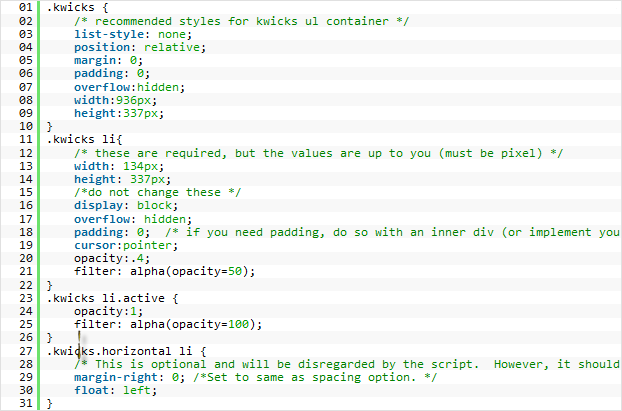 The slider is represented by the bulleted list using .kwicks and .horizontal classes for the <ul> tag. Normally it is strictly necessary to create an id for each <li> tag, but it could be handy when you want to define different appearance (e.g. color, background, etc.) for each slide. This entry was posted in Gallery and tagged gallery, jQuery. Bookmark the permalink.